(Bloomberg) -- Egypt brokered a cease-fire between Israel and Hamas-run Gaza, Israel’s Kan broadcaster reported late Friday, after an attack on the Tel Aviv area dramatically escalated tensions before Israel’s April 9 election. There was no confirmation from Israel, Kan reported. An Isareli government spokesman couldn’t immediately be reached for comment, and there was no official confirmation from Gaza. 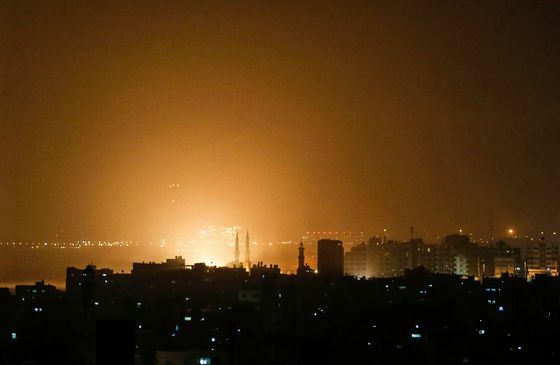 The firing of two rockets toward the country’s heartland on Thursday triggered about 100 Israeli airstrikes on Gaza facilities of the militant Hamas movement, and further rocket fire from the Palestinian territory at southern Israel. No casualties were reported. In a sign Hamas wasn’t interested in a further escalation, the weekly Friday protest against Israel that’s been going on for nearly a year was called off. The Ynet news website reported another development that may also have helped to ratchet down the tensions: there’s growing consensus in the military that the rockets were launched accidentally, it said, without elaborating on the nature of the possible error. And Israeli Prime Minister Benjamin Netanyahu uncharacteristically didn’t speak publicly on the confrontations. The rocket launches at Israel’s center were the first since the 2014 Gaza Strip war, and they provided Netanyahu with an uncomfortable dilemma. Hesitating to strike back forcefully could undercut his support among voters who seek a tough response to attacks from Gaza. A large-scale offensive would entail other risks if Israeli casualties mount. During nearly a year of Hamas-led protests in which more than 260 Palestinians and two Israeli soldiers died, several serious confrontations threatened to verge on war only for the sides to step back from the brink. Israel and Gaza have fought three wars since late 2008. With Gaza having taken the brunt of the violence, and its economy in a shambles, there is little appetite in the coastal territory for another round. The violence erupted as Hamas faced rare protests against deteriorating economic conditions in the impoverished coastal enclave. Wiitnesses said Hamas security forcibly dispersed demonstrations against the dire economic situation on Thursday and Friday, firing in the air, arresting demonstrators and confiscating the cameras of local journalists. Social media activists published accounts and footage of Hamas police officers appearing to beat up demonstrators. Protesters chanted slogans demanding a life with dignity. Hamas said the protests were organized without official permission and that demonstrators threw stones at police. Several days ago, human rights groups in Gaza had accused Hamas of arresting 12 Gaza activists who called for rallies against rising taxes on dozens of commodities. Gaza has been under Israeli and Egyptian blockade since Hamas, considered a terrorist group by much of the West, wrested power from the West Bank-based Palestinian Authority in 2007. It hasn’t recovered from its devastating wars with Israel, and Palestinian Authority President Mahmoud Abbas has made things even tougher with economic sanctions on Gaza intended to weaken Hamas.